I was fortunate to stay 2 days in Maine. I was fortunate to stay 2 days in Maine. The vistas, the cool weather, the roughness of the elements are all here to stay. 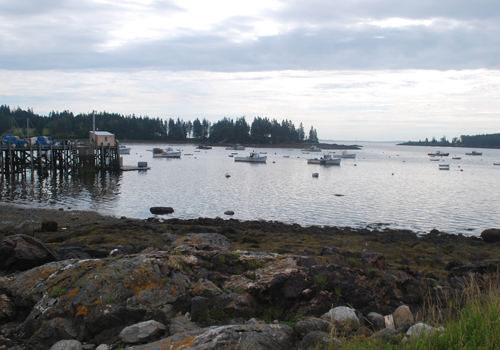 You cannot think of Maine without thinking Andrew Wyeth. 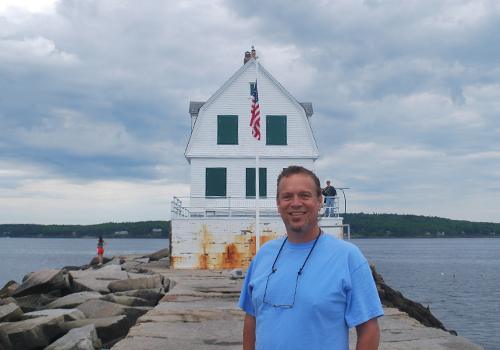 Andrew did so much to help us understand his vision of Maine. I enjoyed seeing his paintings at the Farnsworth Art Museum in Rockland and the work of Frank W. Benson, two of my favorite painters. 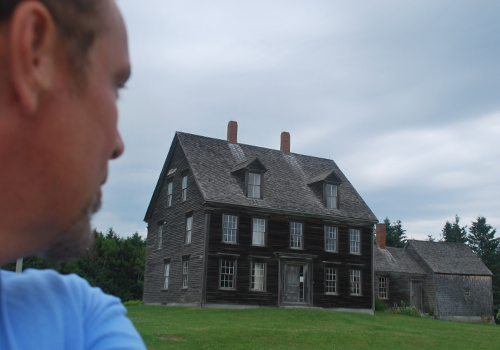 I found the home that Wyeth used in Christina’s World, shown with me in this blog post. I tried to take all of the sights into my artist soul, but it was overwhelming and inspiring. 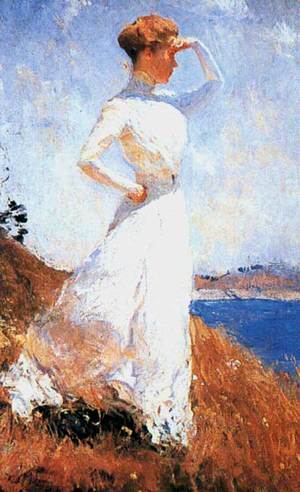 I am looking for a dedicated, very small group of serious painters to accompany me in either August or September of 2013 for a week of painting and exploring Maine. Please email me and let me know if you are interested in accompanying me to this event. Author adminPosted on June 26, 2012 Categories concepts in painting, Historical Sites, plein airTags alla prima, american oil painter daryl urig, Andrew wyeth, christina's world, christina's world home referance, Daryl Urig national workshop tour, Farnsworth Art Museum, frank w. benson, painting knife, painting main with a painting knife, painting maine, painting maine with a pallette knife, serious painters to accompany me in either August or September of 2013Leave a comment on I was fortunate to stay 2 days in Maine. 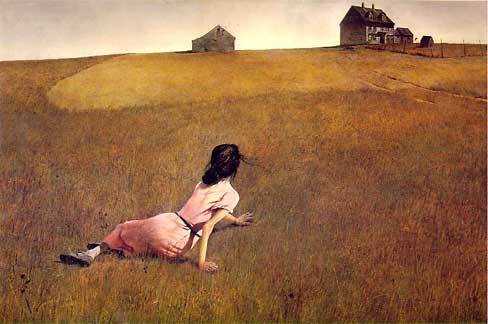 Andrew Wyeth is my inspiration. “Shrimp Boat run aground”. Lots of color in an earth tone painting. I have always enjoyed Andrew Wyeth, my favorite of all the Wyeth painters. Born in 1917 and died in 2009 at the age of 91, truly an American Artist. I enjoyed his simplistic, almost sepia tone approach that added charm and unity to his paintings. To me his works was well thought out with an abstract quality, but he was classified as a Realist Painter. Going for this charm I set out on this painting to simplify its colors to more earth tones. But what I quickly found out that even in an earth tone type painting, subtle color shifts are paramount. Painting Knives: Author adminPosted on January 5, 2012 December 19, 2011 Categories concepts in painting, Oil Paintings for SaleTags alla prima, American Impressionist Painter, american oil painter daryl urig, Andrew wyeth, andrew wyeth an american artist, colorist painter, earth tone paintings, maritime painting, nautical painting, sculpted paint, shrimp boat paintingLeave a comment on Andrew Wyeth is my inspiration. 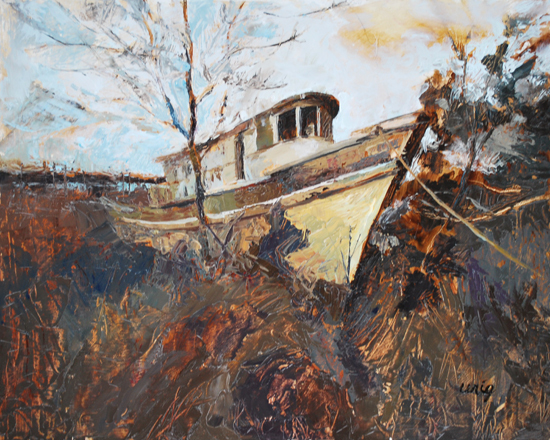 “Shrimp Boat run aground”.